Professor Hyungryul Baik has won the Sangsan Prize for Young Mathematicians 2018 from the Korea Mathematical Society (KMS). 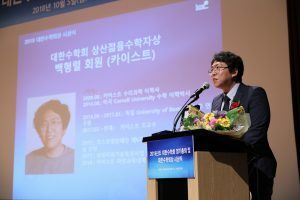 The award is bestowed on outstanding researchers who have completed a Ph.D. within the past five years. The KMS noted that Professor Baik has produced some important findings in the field of 3-dimensional hyperbolic manifolds group as shown, for example, in his recent research paper entitled “Spaces of Invariant Circular Orders of Groups.” The paper was published this year in Groups, Geometry, and Dynamics, a quarterly-issued journal by the European Mathematical Society (EMS). 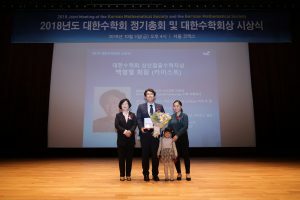 The awarding ceremony took place on October 5, 2018 at the Coex Convention Center in Seoul during the International Joint Conference hosted by the KMS and the German Mathematical Society, October 3-6, 2018. 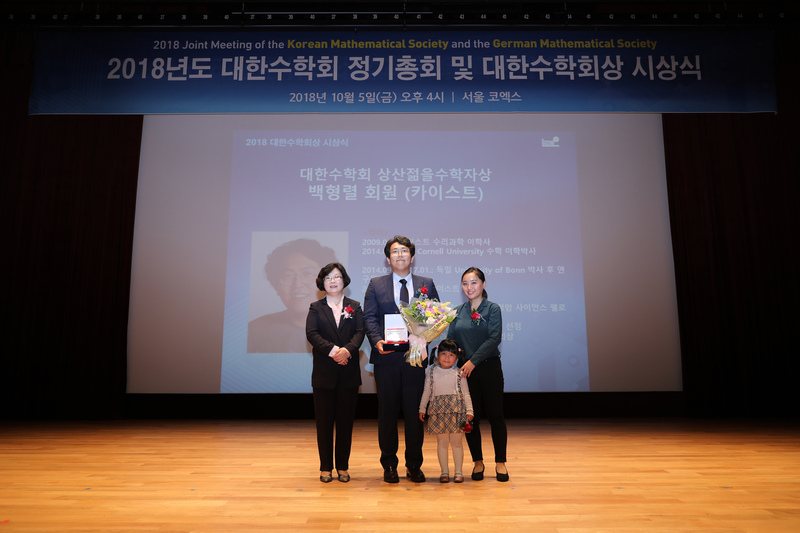 From the left are KMS President Hyang-Sook Lee and Professor Hyungryul Baik with his family. Posted on 2018-10-29 , updated on 2018-10-29 .